Creating a striking landscape effect wherever it is used, Hala, the Hawaiian Screw Pine, creates a tropical landscape effect wherever it is used. It has an open multi-branched silhouette and can grow to 40 foot in height and can spread 12-30 feet. Grown as an exotic landscape specimen in frost-free zones, trees will experience leaf burn at below 28 F.
The Hawaiian Screw Pine is a medium to fast grower and can tolerate light drought, and salt spray. An exotic tropical species from Polynesia that produces a robust, stilt-rooted trunk and a thick densely spiraling crown of mildly spiny light green or often blue-green leaves with very attractive red margins. Screw-Pine has a pyramidal, sometimes irregular, open, but much-branched silhouette, the smooth, stout trunks topped with full, graceful heads of long, thin leaves, three feet long and three inches wide, emerging spirally from stubby branches. These plants are less than 1 year old. The petioles (leaf stems) and the leaves are a glossy green. Ready to be put in a 1 gallon container. about 6-18 inches tall with 3-6 leaves. Full Sun or Light Shade - Plant in fast draining soil. The blue-green foliage color adds to the striking nature of this exotic tree. Pandanus tectorius also makes a stunning container plant for indoors or out. The saw toothed leaves are similar to those of a pineapple plant and emerge spirally from the stilt raised trunk to create a spectacular tropical effect. Small plants are tough and easy to grow and will grow for anybody. Striking plant with long sword-shaped leaves produced in a spiral rosette. As a trunk forms the tree will branch to form several heads, eventually giving a very regular conical specimen plant about 40 feet tall and wide if space allows. Suitable for the home or a greenhouse. The leaves are edged with small red spines and are used to make mats and baskets in the tropics. The leaves of screw pines have fine hooked spines along the edges. But these leaves are tough which makes them useful for thatching, mats, and baskets. Branches have prominent leaf scars which encircle the stems. Large brace-roots emerge from the trunk several feet above the ground, helping to support the plant. Screw-Pine is capable of reaching 50 feet in height but is not usually seen over 25 feet in USDA hardiness zone 10 and 11, with a spread of 15 feet. Growth rate is slow to moderate, depending upon fertilization and watering schedules, and Screw-Pine is very popular for use as a specimen or container planting. But pines they are not; these odd plants are monocots, related to grasses, orchids, and palms. It is not a true pine tree; it is a member of the Pandanaceae family..
Members of the genus are dioecious; male and female flowers are produced on different plants. Pandanus tectorius trees are either male or female. Female trees produce a large, segmented fruit somewhat resembling a pineapple. Male trees produce large clusters of tiny, fragrant flowers surrounded by white to cream colored bracts. The female flowers are crowded along the flower spike. Each flower gives rise to a fruit, known as a drupe. A drupe is a single seed within a fleshy outer layer. (Cherries and olives are examples of drupes.) One hundred or more drupes, each from a female flower, form the aggregate fruit of the screw pine. These clusters are about 1 foot long and are called hinano in Hawaiian.The flowers of the male tree are 1 inch long and fragrant, surrounded by narrow, white bracts. The female tree produces flowers with round fruits that are also bract-surrounded. The fruits are around 8 inches long and have many prism-like sections, resembling the fruit of the pineapple. Typically, the fruit changes from green to bright orange or red as it matures. 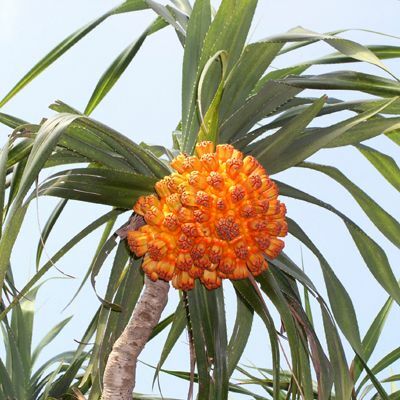 Pandanus tectorius is a small tree growing 20 to 40 feet in height and from 15 to 35 feet in diameter. The trunk is stout and the branches grow at wide angles to it. It has distinctive long blade-like leaves (lau hala) about 2 inches wide and over 2 feet long. Most varieties have spines along the edges and on the midribs of the leaves. Spineless and variegated forms are available. The leaves are spirally arranged towards the ends of the branches and leave a spiral pattern on the trunk when they fall. Pandanus tectorius trees develop support or prop roots (ule hala) at the base of the trunk and sometimes along the branches. It has a stout, wide-branching trunk ringed with many leaf scars. Screw pines received their common name from the fact that the strap-like leaves are spirally arranged around the branches. They are dioecious; staminate (male) or ovulate (female) flowers are borne on separate plants. The male flowers are noted for their fragrance, the females for their distinctive pineapple-like fruit. Ancient Hawaiians used almost every part of the plant. 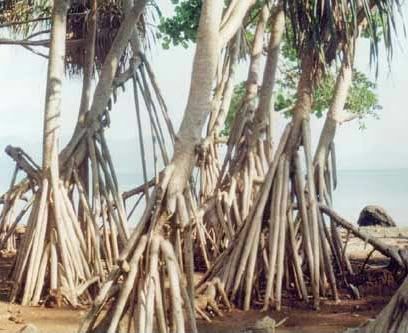 Pandanus trees provided materials for housing, clothing and textiles, food, medicine, ornament, fishing, and religious uses. As screw pines grow larger, they produce prop roots around the base of trunk. These roots act as anchors and aid in keeping the screw pines upright during times of heavy winds and rain. Pandanus is known for the many thick prop roots near its base which provide support as the tree grows top-heavy with leaves, fruit, and branches. Sometimes, though, the lower trunk is injured and decays, leaving the screw pine standing on its prop roots. All good things take time, so I grow my plants and rare palms in my ebay store. Much more to check out or just get a little education on in my store. We ship via USPS Mondays-Wednesday with Delivery confirmation. All live plants are Inspected By USDA Plant Inspectors before they are shipped to insure you get healthy pest free plants and seeds. All live plants are shipped bare-root wrapped in moist sphagnum moss to ensure the plants healthy transit to you. We can ship live plants to the US only. All International shipments are at Buyer's Risk. INTERNATIONAL SHIPPING ON LIVE PLANTS is available only under these conditions! All international orders are shipped at the buyers risk (shipped with or without documents) and no refunds or replacements are offered for Dead On Arrival, loss, confiscation, Customs Seizure, unanticipated charges, etc. The additional charge for any phytosanitary certificate is not included in this offer. For foreign customers, please check your laws concerning permitting and customs, additional shipping and handling costs may apply. We accept online payments only through PayPal, Cash payments are only acceptable for in-person payments and cash-on-delivery (COD). Cash payment can not be sent through the mail. Please only one Paypal payment. SO THE COMBINED SHIPPING RULE WILL CAN BE USED. Multiple paypal payments are NOT eligible for discounts. We will ship once a week - ON or BEFORE WEDNESDAYS, because of the special stamps needed to ship plants and cuttings to you. This can only be done at the Dept. of Agriculture. If payments are not met before that MONDAY, your items will be shipped the following week and lose the combined discount opportunity. Non-paying bidders may receive negative feedback and will be reported as an unpaid item to eBay. INTERNATIONAL SHIPPING is not included in this offer. We will combine shipping for auctions won on the same week paid with same paypal payment. This policy is good for all items bought and paid for in the week ending MONDAY. Payment must be received within 7 days of the auction ending. For 2-3 winning auctions, the combined discount is 10% of the total Shipping and Handling charges. For 4-7 winning auctions, the combined discount is 20% of the total Shipping and Handling charges. For 7+ winning auctions, the combined discount is 30% of the total Shipping and Handling charges. As each order is packed and prepared separately you will pay the quoted S/H charges individually per item. If you buy the same species in that item it does calculate out the discount (i.e. : additional item $3.61). My stores' combined shipping is built in for same items rather than a varied selection. Includes postage, USDA certification and inspection, proper packing and delivery to Airport for prompt delivery. I cant really change any of these. If you want one of this and one of that, it gets hard to discount much as each different species requires it's own prep & packing, then at USDA each has to be unwrapped and inspected then repacked. USDA requires me to clean and prepare every last piece before we drive them to the Inspection Station on the other side of the island. It takes my wife and I, a day to pack items and get ready to ship. The whole next day we drive around the island and get inspected (2-3 hours), then drive to the Airport Post Office to drop off. It takes the same work with the same type item if you can understand. before leaving a negative or neutral comment. I want you to be satisfied. Mahalo iâ `oe no ke kipa `ana mai. E kipa mai hou! Seller warrants seed to be of the variety and quantity advertised. Safe delivery is guaranteed and seeds lost or damaged during shipment will be replaced at seller's expense. Claims must be made within 7 days of shipment. All other replacements, refunds, returns and exchanges will be made at the sole discretion of the seller. Seed is a live product which depends on many important related grower skills such as proper planting time, seed depth, type of soil, irrigation, proper use of fertilizers, weed controls, fungicides, insecticides, disease free soil, and reasonable weather conditions during the growing period. Germination is affected by such factors as temperature, moisture content, light intensity and contamination of planting media. These factors are totally out of the seller's control and are the buyer's responsibility and risk. Consequentially, the seller cannot unconditionally guarantee seed to perform properly regardless of conditions or the buyer's methods or mistakes.